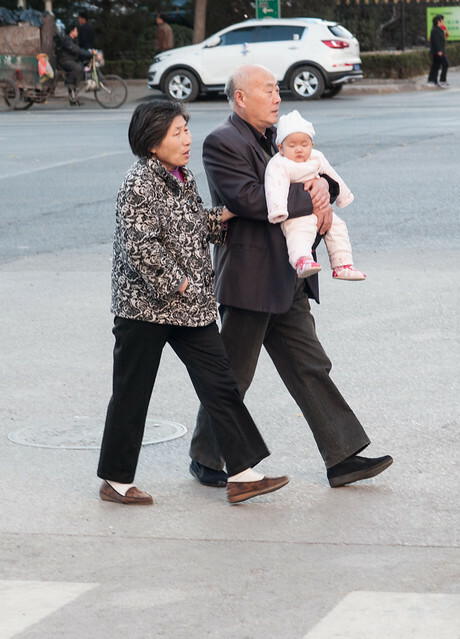 I really liked how instep the grandparents were, and how the grandmother was holding the grandfather’s arm as he carried the baby. I also liked how they were well outside the crosswalk, and the background action. Such is life in Beijing. great little carrier. and a sweet photo. i used to carry you in a back carrier, like a backpack with holes for your legs to go through. you’d sit up high looking at the world. here the baby has a clear view too.